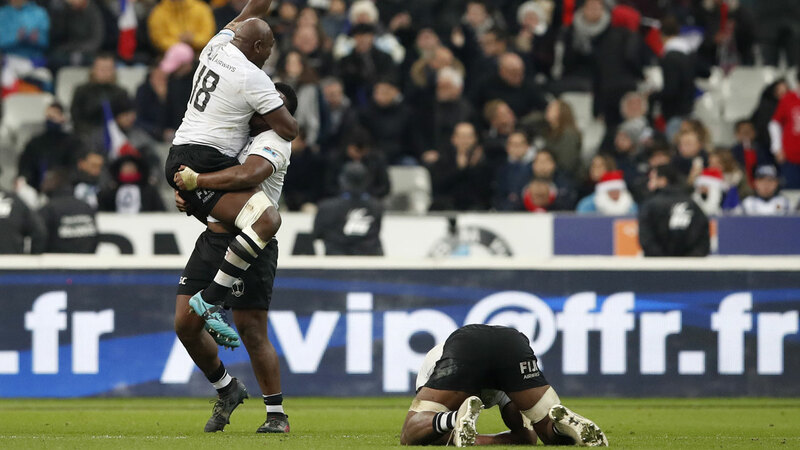 Fiji toppled France for the first time in a rugby international by 21-14 at the Stade de France on Sunday (AEDT). France came from behind to lead 14-12 at halftime, then drew a blank in the second half as Fiji flyhalf Ben Volavola, a former NSW Waratah, kicked three penalties. “We didn’t respect them, they walked all over us,” France centre Mathieu Bastareaud said of a Fiji team that contained former NRL star Semi Radradra. He described the France team as “little boys”. France led 14-12 at halftime, with two tries from captain Guilhem Guirado, both converted by Baptiste Serin, that cancelled out Fijian tries from outside centre Radradra and winger Josua Tuisova. Brunel complimented Fiji on showing more enterprise, but said losing was “incomprehensible. It shows our inconsistency”. Fiji scored first, with Radradra’s defense-busting run to the tryline in the 20th minute. Volavola converted. Right at the end of the half, France scored when Guirado pile-drived through the Fiji defense. Serin’s conversion sent France into the dressing room with a lead against the run of play.